EDITOR’S NOTE--If you can’t toot your own horn in your own blog then why have one, right? Actually, I’m a bit behind putting up a new post on this daily blog so I’m pulling out a story from my archives as a design writer so I can catch up with original copy. The following article appeared in the July 2012 edition of San Diego Home/Garden Lifestyles magazine. The judges for this year’s San Diego Press Club Excellence in Journalism Awards voted the following story Best Feature in Architecture and Design reporting. I’m very grateful. I also won 3rd place in the same category for a hipster apartment building home that I blogged about on March 2, 2012. The winning entry is titled “Lloyd Russell, an architect that gives a damn about renters.” It’s a very cool apartment project on Robinson by the architect that gave South Park “The Station” bar and burger joint on Fern Street. It appeared in SD Home/Garden’s, February, 2012 edition. 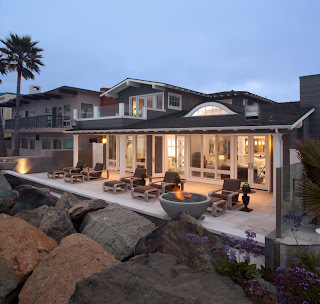 But, for now here’s the first place story, a wonderful beach home. Yes, it’s expensive but what isn’t on the beach in Del Mar? And, the new cool (non) color is white, white and more white in contemporary design. Caio! By Thomas Shess/Photography by Martin Mann (Thanks, Marty). There is a lot to like about this clean-lined Del Mar on-the- beach maxi cottage that will appeal to a wide swath of readers. It has traditional design bloodlines in cozy Cape Cod, but at the same time given California’s coastal zoning limits, this 4,000-square-foot is about as big as a beachfront homes get. Homeowner as interior designer did her homework. Blending custom light gray hues that appear white with dark accents is on pace with what local and national color fashionistas are touting. Also noteworthy is the selection of Kreiss Collection furnishings throughout. The California-look championed by Michael Kreiss is accented here in original art deco commissioned oils and accessories. Interestingly, the kitchen sits on main level between the dining room and the living room. 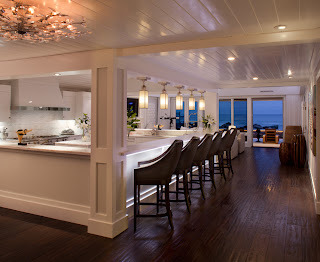 Tall bar stools in the kitchen allow view lines to be observed from the pool through the house to the ocean. Bedrooms and laundry with outdoor terraces make up the top of two levels. But, where her product research has paid off is in the original lighting choices. Nothing here can be called cookie-cutter. The circular dining room chandeliers are not every day. Also, new and well done is the row of elongated bar lights that give the wide-open kitchen visual city limits (definition). The accent lamps are first rate. While the couple requested privacy by not giving their names, she is a retired interior designer and it shows. Mr. Homeowner is a retired developer, who wisely stays in his comfortable office when décor decisions are to be made. All the elements pull together in a very attractive interior package. A savvy reader will note all of the architecture has been designed with square lines—not one inch of bull nosing exists. The only curvilinear elements are found in the furnishings. “That comes from my admiration of modernist icon architect Ludwig Mies van der Rohe,” she says. In fact, the only shelving (his office) is recessed. “Less is definitely more in this home,” he adds. The empty nest couple asked omnipresent Del Mar based architects Bokal-Sneed to design the three bedroom (with rec room), two-level remodel while Solana Beach-based Wardell Builders handled the construction. Bokal-Sneed did not miss a chance to incorporate ocean sightlines throughout the interior. Most obvious is the troika of open living room, dining room and kitchen. The excellent sightlines from these major public rooms are the hallmark of this home. Views not only capture the Pacific only a few steps across the sand, but toward the tightly designed courtyard. Typical of a Bokal-Sneed residence there is no wasted space. Each square-foot earns its keep. For example, the south-facing courtyard incorporates a pocket-sized pool (with clever fountain jets) and a splashy spa that seats a small crowd. By placing (a) the courtyard on the south side the sun is able to warm the patio enabling comfortable chaise lounging year-round. And (b) by placing the courtyard behind the west elevation cuts the chill by blocking the pervasive wind off the ocean, especially after dusk. That common sense design lengthens the indoor-outdoor season for the home. In order to achieve such excellent sightlines the west facing façade is lined with windows and glass doors. When doors are open the breeze cools the home. But on those 60 days out of the year when the sun doesn’t shine in Southern California, the closed doors and windows still honor the gorgeous Del Mar beach and the orange-red sunsets beyond. This remodel defines what most Californians find appealing: comfort, traditional furnishings and colors, plus contemporary clean lines in a seasonally chameleon package that gives us ownership to the great outdoors while never leaving home. Thomas Shess is a lifelong writer and reporter from North Park. His first gig was on the Roosevelt Junior High School student newspaper “The Rough Rider.” From there he has been editor in chief of San Francisco Magazine; PSA (inflight) Magazine; SD Home/Garden Lifestyles and Executive Editor with San Diego Magazine. He is a grad of SDSU and first paying gig off of the Daily Aztec was as a business reporter for the San Francisco Examiner. The Shess Family founded North Park News in 1993. NPN is celebrating its 20th year of continuous publishing under new owners Bob and Rebekka Page. The Shesses are proud parents of Michael Shess, Publisher and Co-Owner of The West Coaster, a monthly craft beer publication based in San Diego. Any Media wishing to pick up this feature, including images may do so providing you credit, author, photographer and San Diego Home/Garden Lifestyles magazine, July 2012 as the original source.